Last year Blackboard celebrated their 20th anniversary as a company, and this year Instructure celebrated their 10th. Yes, the company with Canvas, the "new" LMS solution, is a decade old. 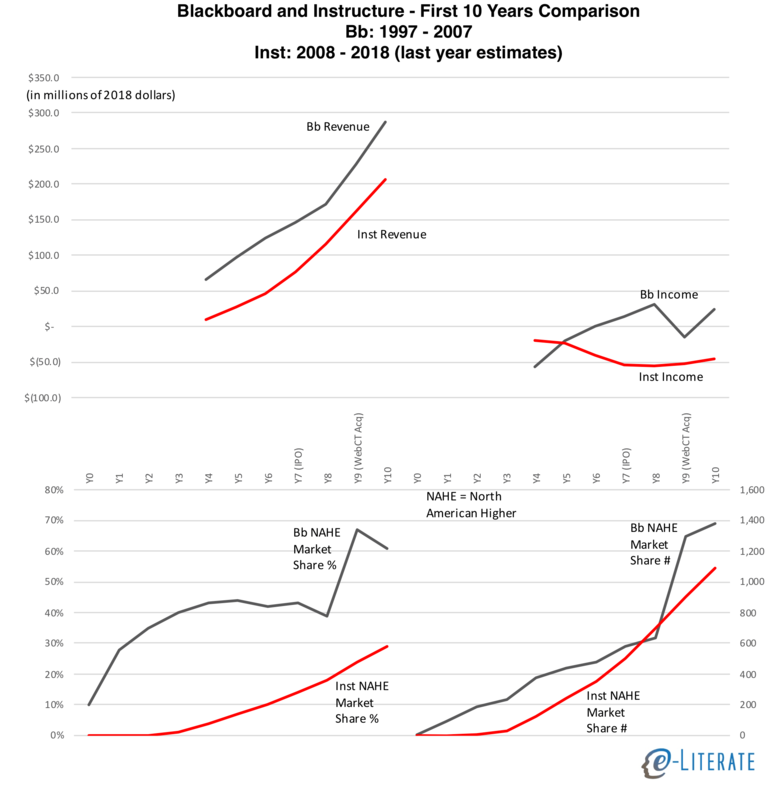 To gain historical perspective, it is interesting to compare each company's first ten years in business in terms of primary financials - revenue and income - and performance in their core North American Higher Education market. We can only go so far in comparing the companies on this basis, however, due to different circumstances. Most importantly, Blackboard helped create the LMS market and therefore had significant portion of its expansion in a greenfield situation, picking up clients who had not previously used an institution-wide LMS. Canvas entered the market well after saturation, with greater than 90% of institutions already having a standard LMS. Blackboard developed its product line pre-cloud, with on-premise hosting being the primary deployment model. Canvas was cloud-native, developed on top of AWS infrastructure. Blackboard's growth was heavily based on corporate acquisition of competitors - Prometheus, WebCourse, WebCT in the first decade - while Instructure's growth has been almost exclusively organic. Both companies sold in more than just the North American Higher Ed (NAHE) LMS market, even if that was the core. Blackboard acquired two companies in 2000 and launched a card-reader transaction business, and they played somewhat in the K-12 and corporate learning space. Instructure developed Bridge for corporate learning, Arc for video platform, and it has a heavy presence in the K-12 LMS market. Interestingly, both companies went public in Year 7 (Blackboard in 2004, Instructure in 2015). With that in mind, let's compare revenue, operating income - both derived from public SEC filings and adjusted to 2018 dollars - and market share in their core NAHE market. The financial data comes from public filings, and data for 2018 for Instructure are estimates based on their outlook presented in the most recent quarterly earnings release. Market share data is based on our LMS Market Analysis service and associated financial analysis for premium subscribers. Blackboard raised ~$185 million in venture financing pre-IPO while Instructure raised ~$95 million (both in 2018 dollars). Part of this difference can be attributed to the much higher costs associated with pre-cloud enterprise software deployment models. Blackboard's revenue was higher than Instructure's at similar points, and their operating income was mostly positive after Year 6. Instructure has maintained a significant loss each year from operations. One way to explain this difference is that Blackboard's used funds for corporate acquisitions, thus fueling growth, while Instructure invested funds into sales & marketing and organic growth. This is not the whole story, but it is a big difference between the two companies. In market share represented as a percentage, Blackboard's growth was much faster, but this was in a period where the market was developing and not all schools had a standard LMS. When viewing this market share in raw numbers, we see that Instructure's growth would have exceeded Blackboard's were it not for the Year 9 WebCT acquisition. Blackboard was already showing organic market declines (in NAHE market share %) and slowdowns in raw numbers outside of the immediate WebCT acquisition of customers. Instructure's organic growth shows no signs yet of slowing down, is less lumpy and more predictable.